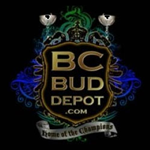 BC Bud Depot - Blue Dream. Free US delivery. Blue Dream, a sativa-dominant hybrid originating in California, has achieved legendary status among West Coast strains. Blue Dream is a massive cash cropper with a dense bud structure packed with glistening trichomes high in THC. The plant can get quite large thanks to its sativa influence making yields very handy. The smoke has a blueberry hash taste and the effect is both physical and cerebral. With colder night time temperatures, the plant will turn purple and blue. With a sweet berry aroma much like its Blueberry parent, Blue Dream delivers swift symptom relief without heavy sedative effects.